Beginning with the Song Dynasty (960-1279) and extending to the last years of imperial China, government seals were engraved in a very stylized Chinese script known as “nine-fold” seal script. This rounded and convoluted script is both ornate and authoritarian but can be difficult to read by the uninitiated. 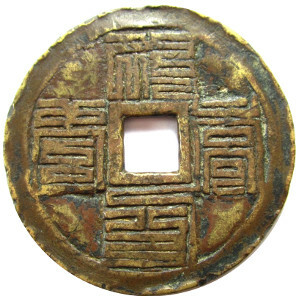 A few very rare coins cast during the Song Dynasty had their inscriptions written in nine-fold seal script ( jiu die wen 九叠文). Shown at the left is a rare Chinese charm dating from the end of the Ming Dynasty (1368-1644) which has its inscription written in nine-fold seal script. According to scholars who can read this script, the inscription on the obverse side is fu shou kang ning (福寿康宁) which translates as “happiness, longevity, health and composure”. This is a reference to the “Five Blessings” (wufu 五福), which was first mentioned in the ancient Chinese classic known as the “Book of History” (shujing 书经). This inscription is often found on old Chinese charms. 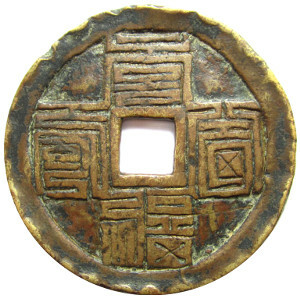 The inscription on the reverse side is also written in nine-fold seal script and, according to scholars, reads as bai fu bai shou (百福百寿). This is an auspicious wish meaning “one hundred happinesses and one hundred longevities”. While the charm shows some wear after having been handled and handed down for some 500 years, the bronze has adopted a beautiful tone and the nine-fold seal script has a wonderful appearance. In addition to its wish for happiness, long life and good health, this charm is a work of art.